Do any of you have a Safeway or a Safeway affiliated store nearby? If you do, you may be able to find a smokin’ HOT coupon booklet! I found this over at The Frugal Find; she was able to find hers in the toiletries section of her local Safeway. These coupons are manufacturer coupons and don’t have any Safeway store logos on them, so you can use them at any store that accepts manufacturer coupons! $4.00 ANY 2 of the following products - Exp. 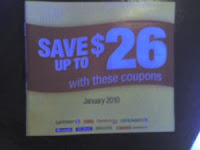 3/31/10: Note - This will prove to be a very valuable coupon.